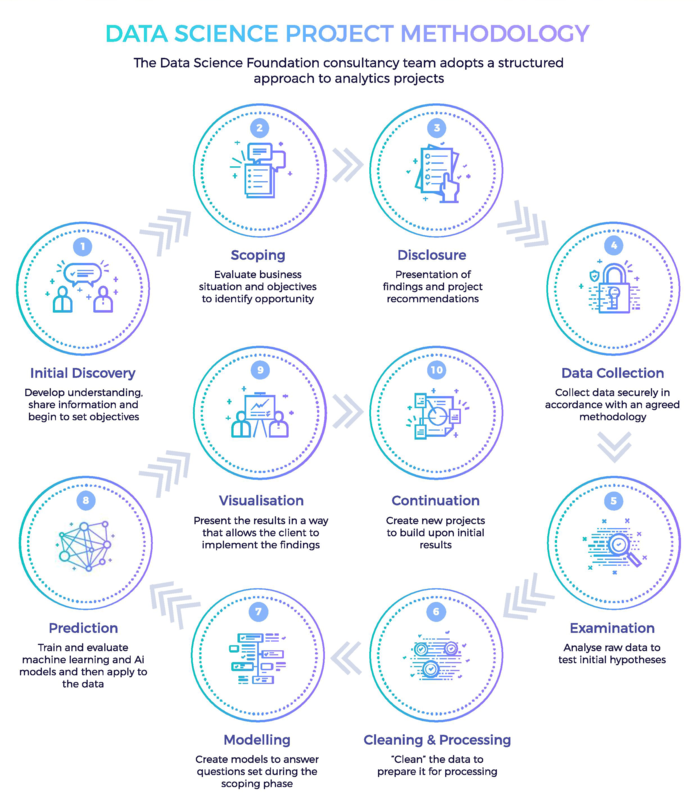 Learn about how the Data Science Foundation Consultancy Service operates and how it could add value to your business. This methodology and the project plan we will develop for you, will enable you to develop a cost benefit analysis before you commit to a data science project. Whether you are new to the world of advanced analytics or are already using data to enable evidence-based decision making, you will want to know how the Data Science Foundation could add value to your business. The process starts with discovery phase; where you educate us about your customers, business objectives and challenges and the data you collect, and we educate you about data science techniques and processes and what your data could do for your business. If we cannot clearly identify how data driven insight could add value to your business, we will not accept a project. The initial discovery is the first face to face meeting between the consultancy team and the client and will take place after background information has been exchanged by telephone and email. The consultants will arrive with a basic understanding of the client’s business, their objectives and data collection practices and will be looking to gather additional information for the project scoping phase. The client will have the opportunity to speak in depth about the business and what they are hoping to achieve. The client will also be provided with information about how data analytics projects work, how the Data Science Foundation manages these projects and the commitments the client is expected to make. The client will be asked to make a commitment to a scoping exercise to evaluate the information gathered by paying a scoping fee. 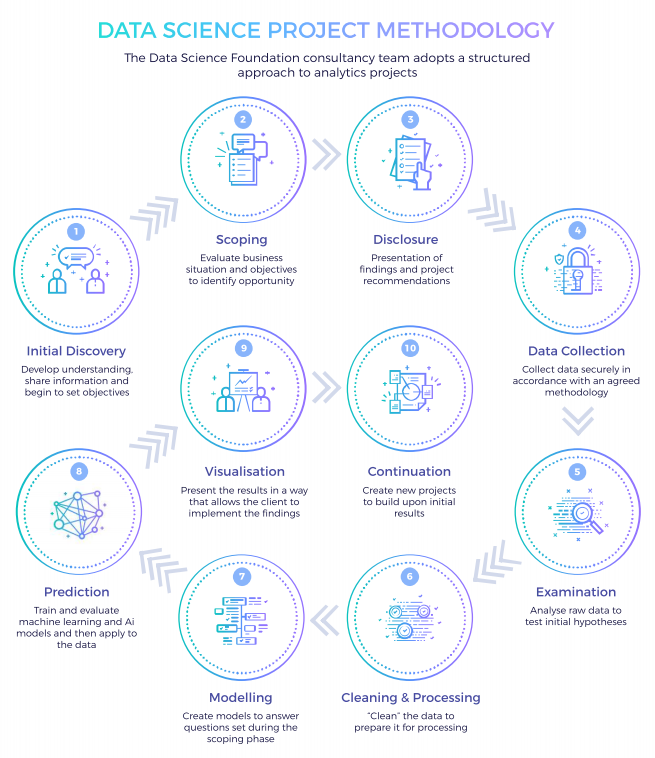 The results of the scoping will form the basis of a data science project and will include all the information needed to launch the project including methodology and costs. This report will be handed to the client, who then could decide to launch the project with the Data Science Foundation or another supplier. At the disclosure meeting the consultant will present their findings and make recommendations about the structure of the most beneficial project. They will explain the technologies and techniques involved, will outline the potential benefits and will educate the decision makers to ensure that they are fully aware of the methodology to be employed. They will also make recommendations on project scale, scope and cost. At this stage the client will be asked to enter into an agreement and pay an initial deposit. Depending on the size of the project, a payment schedule may be recommended. Data will be collected securely in accordance with an agreed methodology. This process varies from client to client and is dependent on the type and quantity of data available and how it is stored. Once the initial set of results have been acted upon and benefits realised. Clients are offered the opportunity to continue the project on an ongoing basis and input new data at regular intervals. The algorithms contained in the models will be updated to improve performance as new information becomes available.